ROMANS 12:12 KJV "Rejoicing in hope; patient in tribulation; continuing instant in prayer;"
9Let love be without dissimulation. Abhor that which is evil; cleave to that which is good. 10Be kindly affectioned one to another with brotherly love; in honour preferring one another; 11Not slothful in business; fervent in spirit; serving the Lord; 12Rejoicing in hope; patient in tribulation; continuing instant in prayer; 13Distributing to the necessity of saints; given to hospitality. 14Bless them which persecute you: bless, and curse not. 15Rejoice with them that do rejoice, and weep with them that weep. 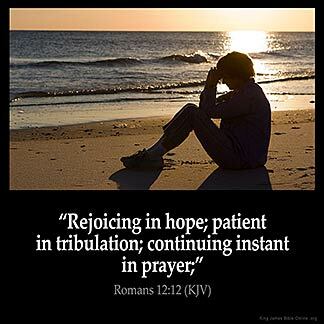 Reioycing in hope, patient in tribulation, continuing instant in prayer. 12:12 Rejoicing in hope - Of perfect holiness and everlasting happiness. Hitherto of faith and love; now of hope also, see the fifth and eighth chapters; afterwards of duties toward others; saints, #Ro 12:13 persecutors|, #Ro 12:14 friends|, strangers, enemies, #Ro 12:15|, &c.
Ro 12:12 Rejoicing in hope. Hopeful, and hence rejoicing in the prospect. Patient in tribulation. Patient in sorrow, suffering and persecution. Patience implies steadfastness. Continuing instant in prayer. "Continuing steadfastly" (Revised Version). "Praying always and fainting not" (Lu 18:1).